Don’t believe everything you hear about hardwood floors! Hardwood floors are a gorgeous option for any home. In fact, in terms of aesthetics, no other flooring material can match up to hardwood. However, many people don’t even consider hardwood floors because they believe it be too expensive or too easily scratched. There are so many myths about hardwood floors, and if you’d like to enjoy these beautiful floors in your home, you shouldn’t let them hold you back! To learn the truth about common hardwood floor myths, check out our latest blog. 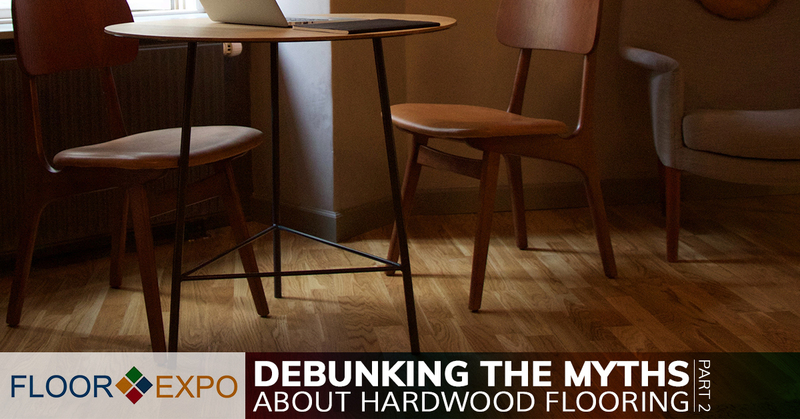 Keep reading to learn about more hardwood flooring myths. Myth #6. Hardwood floors show more dust and dirt. This one is true, so it’s technically not a myth at all. However, it’s not a negative thing, like many people would have you believe. While, yes, you will be able to see dust and dirt more easily on your hardwood floor, it doesn’t mean that the same dirt and dust isn’t lurking inside your carpet. But, with carpet, you’ll never be able to see the dust and dirt, which means that you’ll be breathing it in, along with allergens, mold spores and other nasty debris that get stucks deep within your carpet. Even worse, if it gets pushed too deeply in the carpet, you’ll have to have your carpet professionally cleaned, but with hardwood, you can simply vacuum or sweep the dust and dirt away. Myth #7. Hardwood floors can’t stand up to the damage caused by kids or pets. If you have a house full of kids and pets, it’s natural to think twice about a costlier flooring option, like hardwood, but in reality, hardwood can still be a great option, even if you have kids or pets. While the wood itself will certainly play a role in how durable your hardwood floors are, the finish is what really determines how much your hardwood floors can handle. And, you’ll be glad to know that there are many finishes out there that can make your hardwood floor sturdy enough to take on the abuses of kids and pets. Myth #8. Hardwood floors cannot be installed in kitchens. Maybe you love hardwood floors, and your entire home is covered in them, except the kitchens. That hardwood floors don’t belong in kitchens is one of the most common myths out there, and while, yes, it’s not ideal for your hardwood floor to be exposed to too much moisture, you can help to protect your floors with a few well-placed rugs. Myth #9. Hardwood flooring is a bad investment if you’re planning on selling your home. As we mentioned in our previous blog, hardwood flooring is among the more expensive options for flooring, at least up front. However, hardwood floors can last a whole lot longer than most other flooring options, and its longevity is where you enjoy the biggest bang for your buck. But, if you aren’t planning on living in the same home for all of that time, is it really worth the investment? Yes! 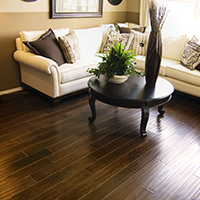 Hardwood floors can add value to your home, and they may even help you to sell your home faster. Myth #10. Hardwood floors that are engineered are not real hardwood floors. Believe it or not, engineered wood flooring is actually a type of hardwood flooring, except that they are made from multiple layers of wood and wood veneers. The only part of engineered hardwood that isn’t “real wood” is the adhesive that is used to secure the veneers to one another, as well as the finishing used to protect the hardwood. Are hardwood floors the right option for your home? Contact our hardwood flooring installers online today to find out!